A Range Rover driver who was late for work after a drinking session the night before drifted onto the off-side of the road and ploughed head-on into an oncoming cyclist. 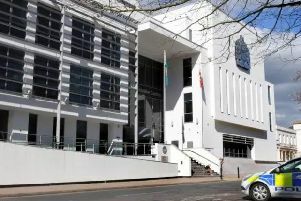 The rider, Leamington man Simon Worthington, whose wife was expecting their second child at the time, died at the scene, a judge at Coventry Crown Court has heard. Range Rover driver George Hacker was jailed for four-and-a-half years after pleading guilty to causing 35-year-old Mr Worthington’s death in February by dangerous driving. Hacker, 26, of Stowe Drive, Southam, was also banned from driving for six years and three months – so he will effectively remain disqualified for four years following his release. Prosecutor Matthew Brook said that the night before the tragic collision, Hacker had been out drinking with friends, and when he got home he had three whiskies and a line of cocaine. In the morning, he was due at work for eight o’clock, but he overslept, and did not leave home until around 9.45am. While driving his Range Rover Evoque, he was on his phone via Bluetooth to a friend. And as he drove along the B4452 Ufton Road near Harbury at just after 10am, he later said, he was distracted by seeing a vehicle in a field which seemed to have accident damage. He drifted onto the off-side of the road, and ploughed head-on into Mr Worthington who was cycling in the opposite direction on his bike and had no time to react. Hacker continued on the wrong side of the road causing a woman driving in the opposite direction to fear he would hit her as well, before stopping. The emergency services were called, and as paramedics tried to save the critically-injured cyclist, who was training for a triathlon event at the time, Hacker was arrested and was found to have a small amount of cocaine on him. Despite the determined efforts of the paramedics, Mr Worthington, a data analyst with Barclays Bank who lived in Leamington with his wife Emma, who was expecting their second child at the time, was declared dead at the scene. Jailing Hacker, Deputy Judge Richard Griffith-Jones gave him a concurrent three-month sentence for possessing cocaine, which he had also admitted.